Plain film radiography is an integral part of many diagnostic procedures. A typical focal film distance of 150 centimetres. This utilises the inverse square law resulting in a lower patient absorbed dose as well as reduced magnification, less distortion and improved resolution of the final image. The use of a compression band to reduce scatter radiation and contact gonadal shielding secured to the compression band. The use of Shimadzu Sonialvision G4 ultra low dose x-ray equipment. Higher KVp and lower mAs techniques. When combined with a digital plate to capture the images, these techniques deliver high quality images with a patient dose that is As Low As Reasonably Achievable, ALARA. Patient measurement to ensure optimum exposure factors are used. 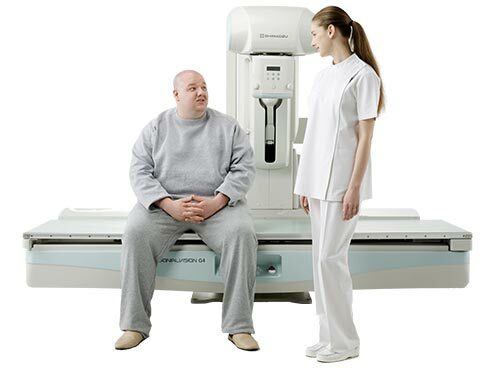 Patient positioning which allows for an increased focal film distance for all standing weight-bearing radiographs. 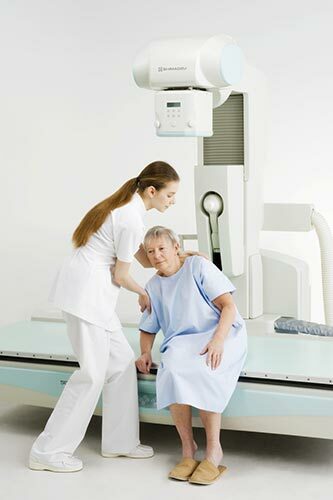 In addition, the use of standing weight-bearing x-rays can be a useful complement to weight-bearing MRI provided by Bayside Standing MRI. To make an appointment with Brighton Radiology, please go to our Appointments Page. Imaging expertise for spine, sports and activity-related injuries / disorders. We’re also available after hours for urgent cases. Phone 0417 160 912 for after hours service. We're located at 130 Male Street in Brighton, just off Bay Street.